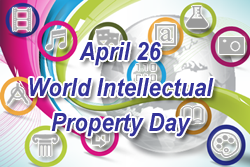 On April 26, the World Intellectual Property Organization (WIPO) celebrates the World Intellectual Property Day. The date is set by the Member States of WIPO at a meeting of the General Assembly in October 1999 when taking the decision to create this holiday. April 26th is the day on which in 1970 the Convention establishing WIPO entered into force. Every year the Organization commemorates the Intellectual property day with different activities and events. The aim is to raise awareness of the people - their understanding of intellectual property and the role that patents, copyright, trademarks and design play in our daily live, “how protecting intellectual property rights helps promote creativity and innovation” and „to encourage respect for intellectual property rights of others”. For this year’s celebration WIPO sends a message for a look to the future and it will run under the motto “Creativity: The Next Generation”. What used to be science fiction years ago is our world today. What awaits us in the future - we all want to know how our world will look like tomorrow. How the development of high technology and digitization will affect the way we live, which will be the new inventions, how would we communicate or listen to music, work or heal, what are future great inventors and artists? On this theme WIPO offers a variety of activities and initiatives to spread their message around the world - from concerts on stage, exhibitions and different competitions to holding seminars at universities and public debates on “hot” issues in the field of intellectual property, etc. “The future? Ask the next generation.”- Says the World Intellectual Property Organization. Intel tried unsuccessfully to stop the use of the mark Intelmark, owned by CPM, through the European Court of Justice on the ground that it would dilute its famous mark. According to the Court the fact that an earlier mark has a “huge reputation”; that its goods or services are dissimilar to those of the later mark; that the earlier mark is unique; and that for the average consumer “the later mark calls the earlier mark to mind” is “not sufficient” to establish that the use of the later mark “takes or would take advantage of, or is or would be detrimental to, the distinctive character or the repute of the earlier mark”. It was explained that a proof detriment requires evidence of a change, or likelihood for such a change in the future, in the economic behaviour of the average consumer of the goods or services bearing the earlier mark. This is likely to require famous brand owners to provide survey or to seek for other evidence a change in consumers “economic behaviour”. “Тhe fee for the national reports for examination, is changed from 192 EUR to 144 EUR coming into force from 1 January 2009. The amount of 144 EUR is formed by individual fees of 12 EUR for every national report for examination multiplied by the number of central offices for industrial property of the member-states (presently 12) - Austria, Bulgaria, Greece, Denmark, Spain, Lithuania, Poland, Romania, Slovakia, Hungary, Finland and Czech Republic). The change in the fee will be applicable for applications for Community trademarks, received from 01.01.2009. The Madrid Protocol Concerning the International Registration of Marks will enter into force with respect to Bosnia and Herzegovina on January 27, 2009 as the country deposited its instrument of accession to Protocol on October 27, 2008. The combined cost of CTM application and registration fees has a planned reduction, with around €1 000. According to Mr. McCreevy, a Commissioner responsible for the internal market, the reduction would bring access to trade mark protection down by 40%, which will help European companies have more savings. In the last review of OHIM for the activity of the member states of EU regarding the Community trademarks, information about Bulgaria was published. It is mentioned that the first Community trademarks that are registered by Bulgarian applicants were made back in 1998. The total number of applications for trademarks from Bulgaria is 667, having in mind that during 2008 they have been 229. According to OHIM data the most frequently applied trademarks from Bulgarian companies are the figurative (59%), followed by the word (39%). Regarding the classes in applications the most frequently applied classes are 35, 30, 29. In its analysis about Bulgaria OHIM makes a ranking of the Bulgarian companies, which apply most for Community trademarks, as well as of the intellectual property representatives, who appear most frequently in the applications. In the table below are mentioned the companies, which have the biggest number of applications for Community trademarks. From the above ranking it is obvious that the biggest applicants from Bulgaria are top companies in the country. Bella Bulgaria AD which is a member of Association of Trademark Owners in Bulgaria takes sixth place in application activity with 11 applications for Community trademarks. In the ranking of the intellectual property representatives made by OHIM appear the names of some of the best representatives in Bulgaria, as at first place is Mr Ivan Ivanov from the intellectual property consulting agency IP Consulting. On 22 September 2008 Francis Gurry was officially appointed for Director General of WIPO. He was elected with only one vote in a tense voting day on 13 May 2008.